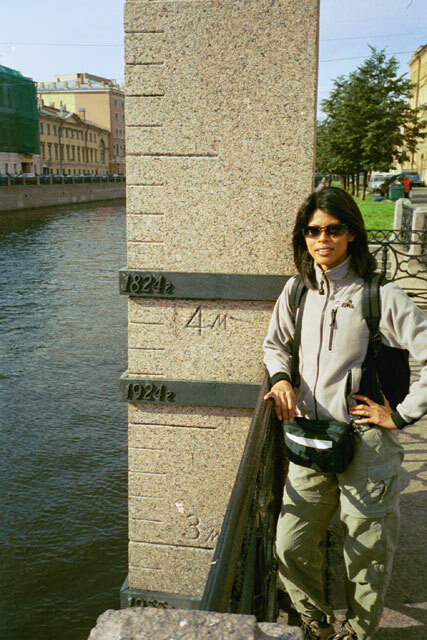 Start St. Petersburg (home stay on Gorokhovaya) N59º56.353' E030º18.898' 7 meters . 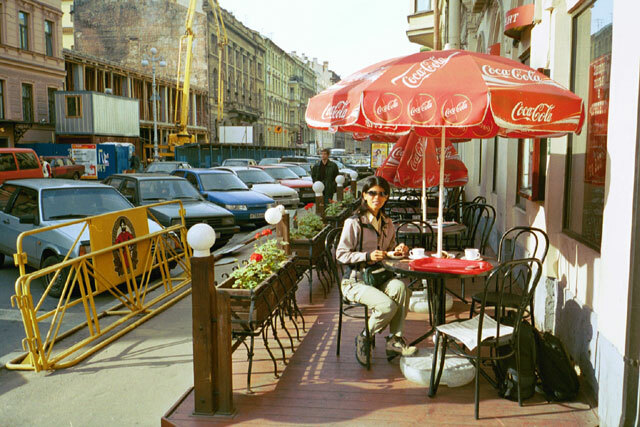 - Tour city . . . .
St. Petersburg (home stay on Gorokhovaya) N59º56.353' E030º18.898' 7 meters . Finish Aboard Train #025 - Smena (St. Petersburg to Moscow) . . . . Weather: Partly cloudy, sunny and cool in the morning. In the afternoon, overcast and cool. In the evening rain. This is our last day in St. Petersburg and we are going to try to squeeze in as many of the sights that we still want to see. It will be tough, as it includes a couple of major museums, but there is just so much to see and do here. We spend some time in the morning packing our bags so that we will have very little packing left to do when we get back to the home stay later this evening. We know that, despite the best of planning, we are likely to be running behind schedule. We hit the streets at 10 AM and our first stop is at one of the neighborhood cafes. It is a pleasant place, but the service is unfriendly and cold. This is one thing that we will certainly not miss about Russia. After we have finished our coffee and snacks, we head on. We walk towards the Yusupov Palace museum, walking along the canals. Along the way, we see another set of flood markers, indicating how high the water had gotten during some of the worst floods. And the water certainly got high, flooding streets and a good portion of the ground floor of many buildings. 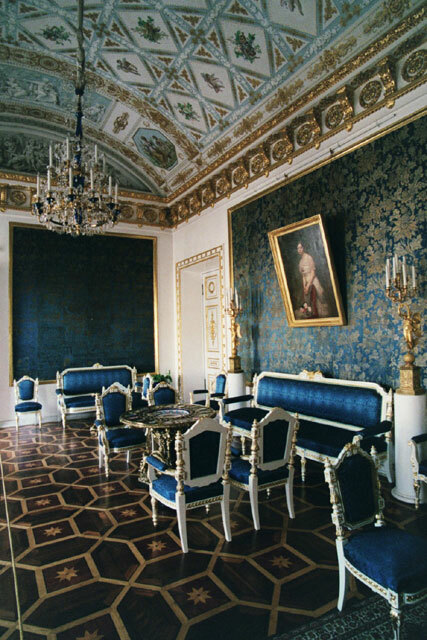 Our tour of the Yusupov Palace is one of the better values we have had in St. Petersburg. The entrance price is reasonable, they give you a walkman with audio guide and they let you take all the time you want. The staff were even friendly and helpful. We felt like we had been warped to a different parallel universe. There is an extensive series of rooms that we get to wander through and listen to the history and background of the room. 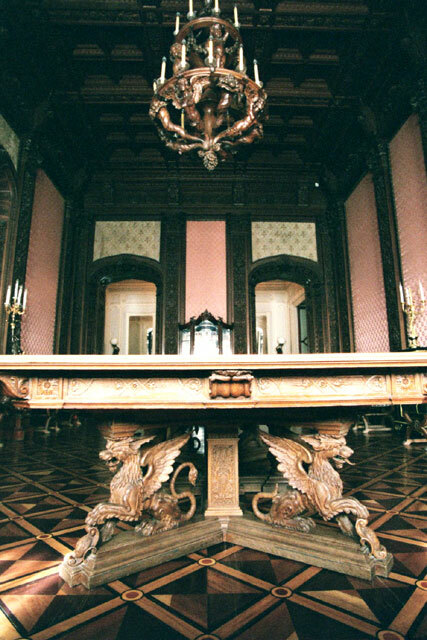 The restoration work was fantastic and the furniture and other decorations in the rooms were so interesting. We went through about 20 rooms, so it is hard to describe them here. It is also hard to choose which rooms to highlight. The main staircase was awesome, with double staircases from the ground floor merging to form one as you approached the second floor. It has some stunning statues, reliefs and other decorations. We went through the Green Drawing Room and then the Red Drawing Room. 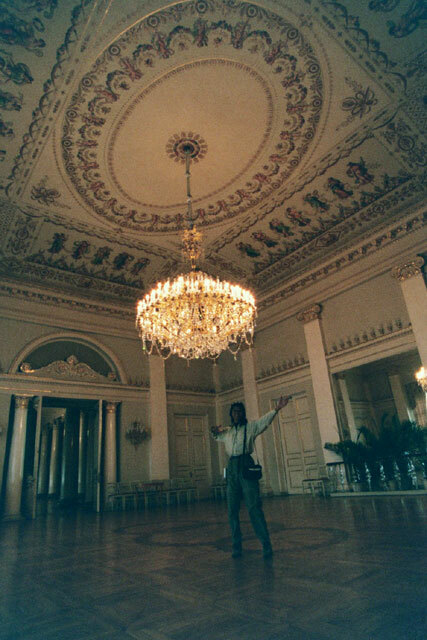 Then there was the Blue Sitting Room, followed by the Grand Rotunda Room with its small dome in the ceiling. Heading back through this rooms and across the hall, we came to the Dance Hall and the Banquet Hall. 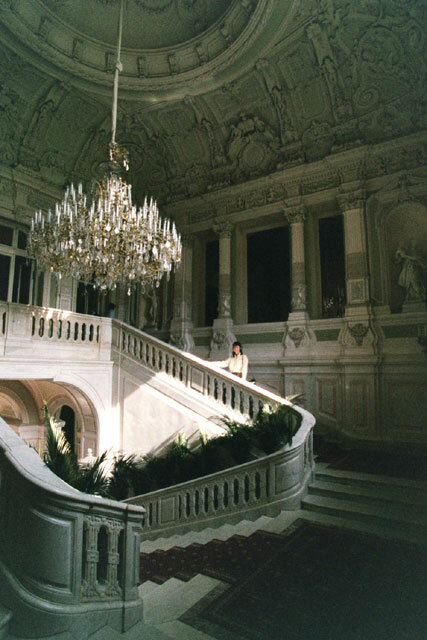 This huge hall even had two balconies from which the bands would play the music of the day. It is then on to the Antonio Vighi Room and the Art Gallery. The collection of art here in this former private residence is extensive and impressive. Then it is on to the Roman Room. What must be the highlight of the whole tour of this grand palace must be the family theater done in the Rocco style. This theater is just out of this world. 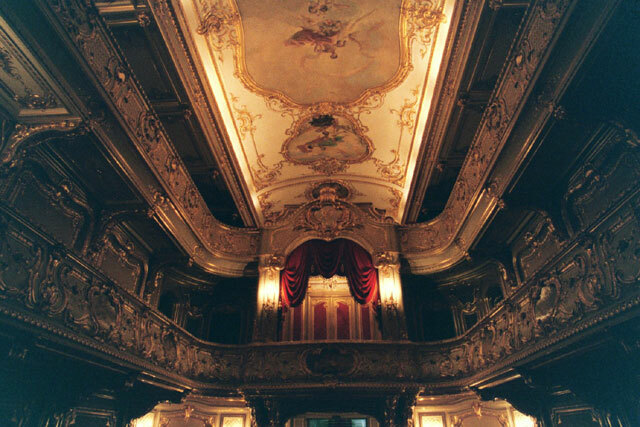 It would rival any in the best theaters in the world for beauty. It can seat 180 people in an intimate, but grand, setting. 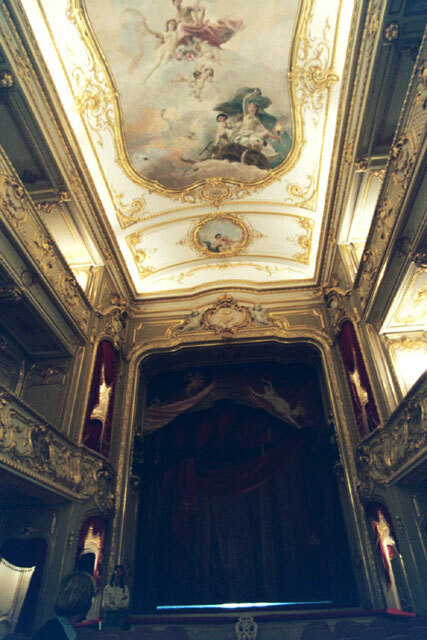 The gilding is extensive and the paintings on the ceiling are wonderful. The seats are set up in a U-shape, with the stage at one end. It would be wonderful to see a performance in this theater. After the theater we made our way back through the art gallery to the Oak Dining Room. This was another well done room, with a huge oak table in the middle of an oak paneled room. Then it is on to the Musical Drawing Room, The Henri II Drawing Room and the Prince's Study and the Turkish Study (with its skylight). The Billiard Room next door would be the envy of any bachelor. 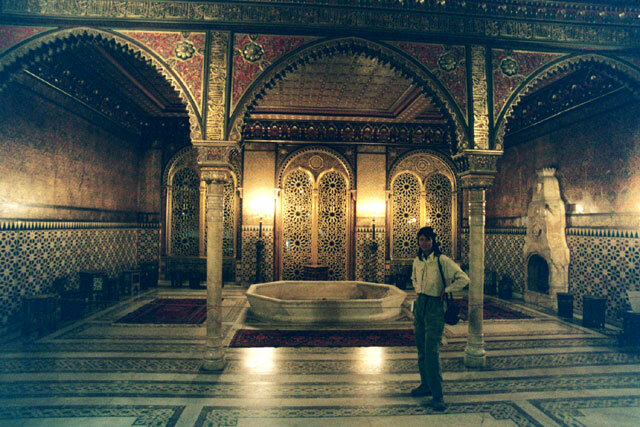 There was then the Moorish Room - it is difficult to describe this room that is a combination between a bathhouse and a spa. The intricate mosaic work is a riot of colors done in the typical Moorish style with the Islamic arches and coffered ceilings and fountain. We finished off our tour with the Dressing Room (with its small bathtub - a major luxury in those days), the Bedroom and the Buffet (Family Dining) Room with its leather covered walls. This latter room had been turned into a museum shop. They had some interesting stuff, but it was very pricey and we did not have enough time to see if there was anything that we wanted. 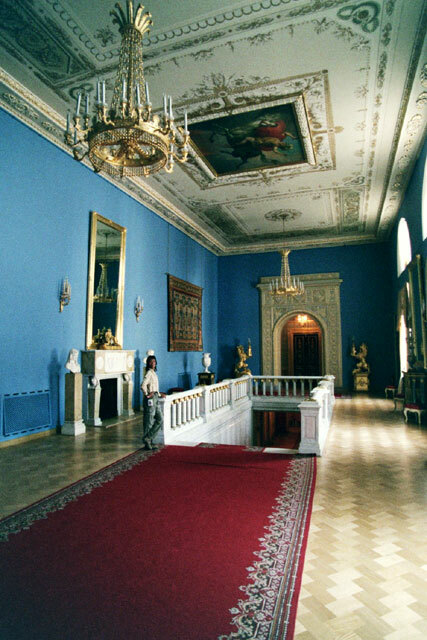 This palace also has the cellars which houses an exhibition on Grigoriy Rasputin, the infamous "holy man" who was murdered here by Prince Felix Yusupov. Talk about a gruesome death - being poisoned, shot, beaten and then drowned. Well, we were unable to tour the cellar as all the tour spots were full. After finishing touring this fascinating palace, we head back out onto the streets. First some final shopping, then we change some more money and finally we have a quick lunch. It is now time to have a quick visit to the Russian Museum. 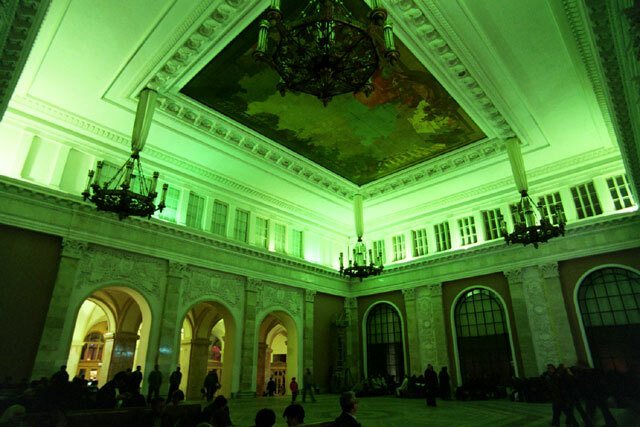 The museum is housed in the Mikhaylovskiy Palace and it holds one of the world's greatest art collections. We only had a couple of hours before closing, so we quickly went around looking at some of the highlights, including the moving "Barge-Haulers on the Volga", foresightful "Knight at the Crossroads" and the monumental "The Last Day of Pompeii." As we leave the museum, it has just begun to lightly rain. 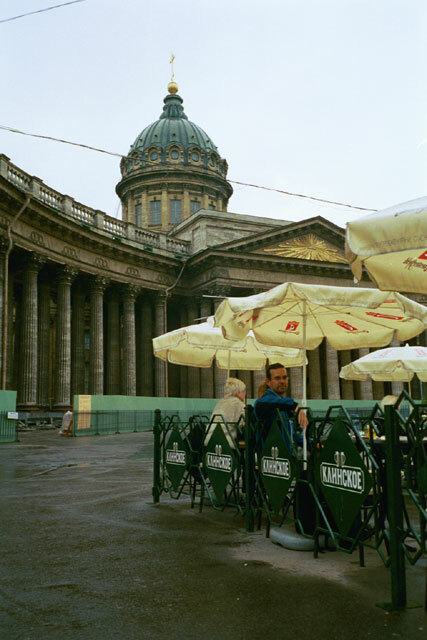 We decide to have a quick drink and snack at one of small beer bars set up outside Kazan Cathedral. We grabbed one of the few remaining tables and huddled under its umbrella to stay out of the rain. On our way back to our home stay, we briefly stopped at the internet cafe to check our emails. We get back to "our" apartment at 7 PM and we have about an hour to take a shower, get our act together and to pack our bags. After taking our bags out of our room so that our hostess can clean it for her next guests, we head out for a quick dinner before returning to collect our bags and catch our taxi. The taxi ride is another bad experience in Russia. We had been told that the fare would be a fixed, flat fee when we booked it over the phone. But on the way, the driver turned on his meter and due to the bad traffic, it ticked over fast a soon blew past the agreed amount. When we got to the train station, we had an unpleasant time sorting this out. We paid more than we would have liked to and he got less than he was demanding. Everyone was unhappy - not a good situation and an unfortunate way to leave St. Petersburg with a bad taste in our mouths. We arrive at the station shortly before 10 PM and have a few minutes to spend before we can board the train. We take some pictures in the waiting hall and pick up a few supplies before heading out to the platform. Soon, the provodnitsa comes out and after checking our tickets and passports, we board the train. This will be our last train ride on this trans-Siberian trip and it is a bit sad. But we are also glad that this is the last leg and we will be heading home soon. We have plenty of time to settle into our compartment and even go and take some pictures and explore a bit. Then Train #025 - the Semna - departs on time from St. Petersburg - KM 460 and we are on our way to Moscow. 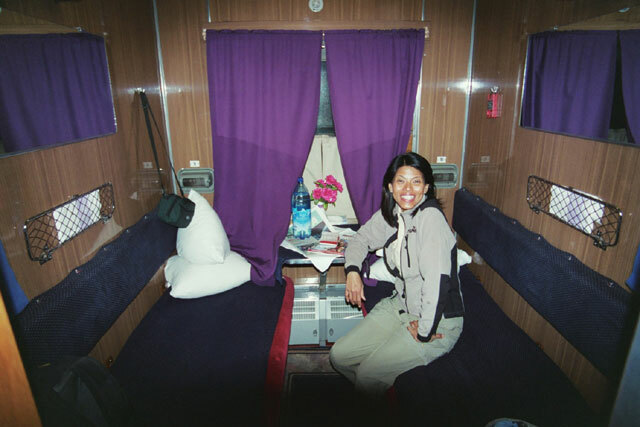 As we do not have much time on this train and it will be arriving in Moscow at the crack of dawn, we had already started to get ready for bed and soon after the train pulled out of the station we were soon settling into our bunks.